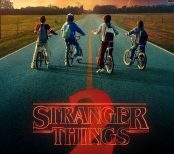 Following today’s (October 27th) launch of Stranger Things Season 2 on Netflix, the SVoD service has also launched its first after-show. Entitled Beyond Stranger Things, the show is hosted by writer, producer and actor Jim Rash, and will offer behind-the-scenes stories, episode analysis and answers to “all the burning questions”. As with Stranger Things, all episodes have been released at once, giving Netflix users the option to watch each one in tandem with its related instalment.